Over time we expect hardware to commoditize and it will become all about the software. The intelligence will be in the software. Providing capabilities like data protection, storage efficiency and storage performance optimization. We’ve also built a new storage division focused on extending our leadership in flash. 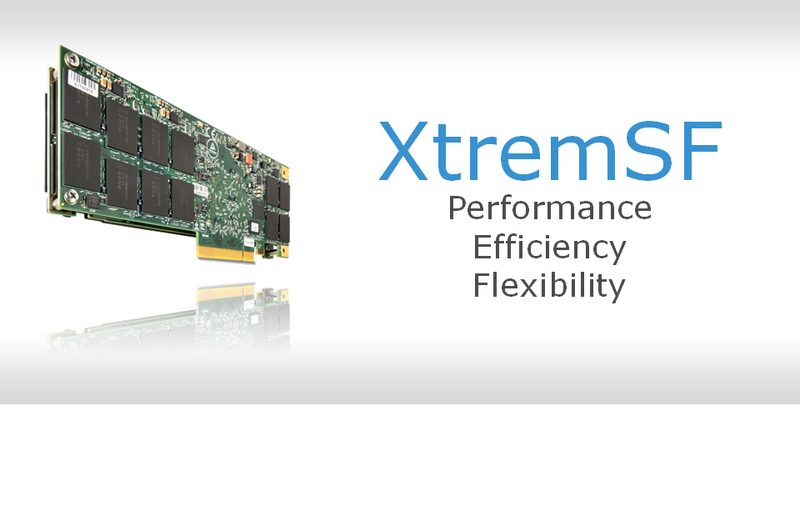 XtremSF is a family of PCIe flash cards deployed in the server to dramatically improve application performance by reducing latency and accelerating throughput. 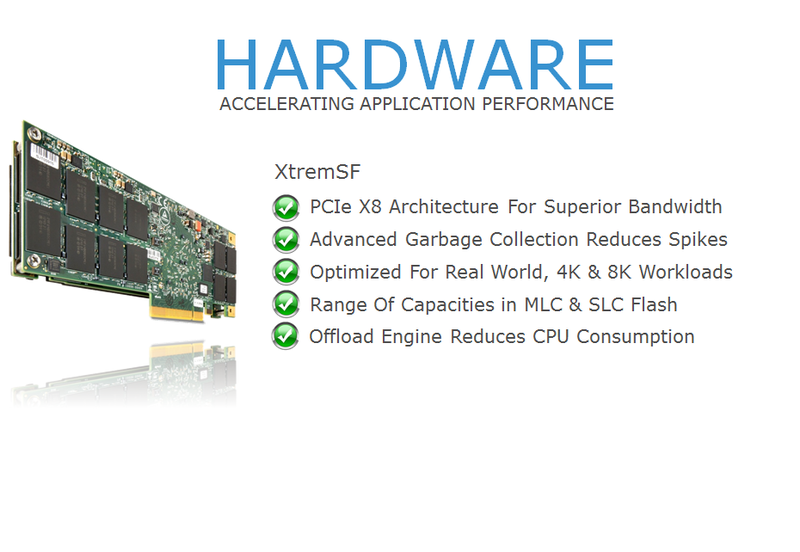 XtremSF leads the industry in performance and is able to deliver up to 1.13 million iops. This is impressive for a hero number but even more impressive is the real world application workload results that this family can attain. Designed for flexibility , these flash storage cards can be used as a local storage device to accelerate read and write performance for high-transactional, high-performance applications or in combination with EMC server caching software to accelerate read performance in conjunction with network storage arrays such as VMAX and VNX with data protection. 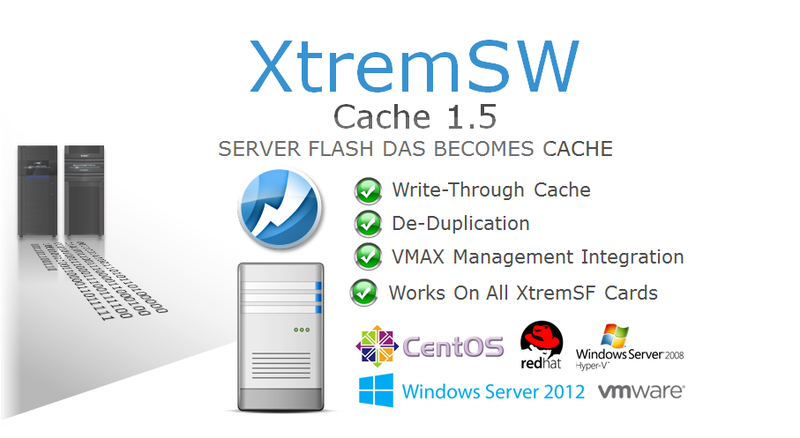 XtremSF is available in 550 GB, 700 GB, 1.4 TB and 2.2 TB eMLC capacities, and 350 GB and 700 GB SLC flash capacities. VFStore offers best-in-class performance and capacity. At half-height, half-length, VFStore is a single low-profile card that fits in any rackmount server within the power envelope of a single PCIe slot. Processing 340,000 IOPS and 30 microsecond latencies, VFStore offers the industry’s best performance. It enables you to achieve memory-class performance without actually having to acquire additional memory. And the 2.2 TB VFStore card is the industry’s highest storage capacity in the smallest half-height, half-length footprint. In addition, XtremSF has an advanced Flash Management and Garbage Collection architecture which allows for consistent I/O performance. While other architectures incur a performance penalty during garbage collection, XtremSF is designed to give consistent high performance with no performance degredation during background flash management activities. These operations are also designed to be offloaded onto the PCIE card, thereby saving server cycles and leaving the server to be used for what it was intended for. Available in a range of mlc and Slc capacities, as you will see in a couple of slides, XtremSF focuses its performance architecture on real world 4k , 8k workloads. These workloads are designed to leverage multi core server operations and the parallelism that these severs can deploy as opposed to hero number workloads with little opportunity for parallelism. With this announcement , we are taking the opportunity to rename our flash portfolio all under the Xtrem flash brand name. With this announcement, we are now adding the capability for XtremSW Cache to run not only on SLC PCIe cards, but all of the XtremSF MLC and SLC server flash cards we have announced today. This gives customers the flexibility to use server flash as either local storage, cache or due to our split card technology, BOTH! While caching in a great value in front of network storage, adding software value to XtremSF deployed as a local storage DAS device or even as a memory extension is also a direction for us. By abstracting out the flash and managing the flash across servers providing added data services such as mirroring as well as pooling in order to create a pool of Server Flash that can be accessed and managed independent of location . As you fill out more enterprise use cases, they increasingly depend on the infrastructure for data services. Applications like server consolidation, database consolidation and VDI all have massive consolidation which creates a truly random IO pattern and the data can be mission critical, requiring extensive data protection. This is the ideal use case for an all flash array, designed from the ground up to leverage the low latency of flash while supporting the unique endurance requirements that flash as a medium has. At EMC, we are pleased to introduce you to EMC XtremIO our all flash array purpose-built for flash. The XtremIO architecture challenges many of the previous assumptions about building an all-flash array and truly rethinks the core design criteria. First, it is a software defined storage array. Most previous products rely on proprietary flash modules, controllers, and FPGAs to deliver performance. XtremIO on the other hand leverages commercial off-the-shelf hardware – in fact hardware we already had in our global hardware engineering catalog that we leverage on other EMC products, including standard form factor SSDs. The magic of XtremIO is in the software stack. This allows us to quickly innovate new features, and take advantage of the latest hardware advances rapidly, while leveraging the commodity price curve. 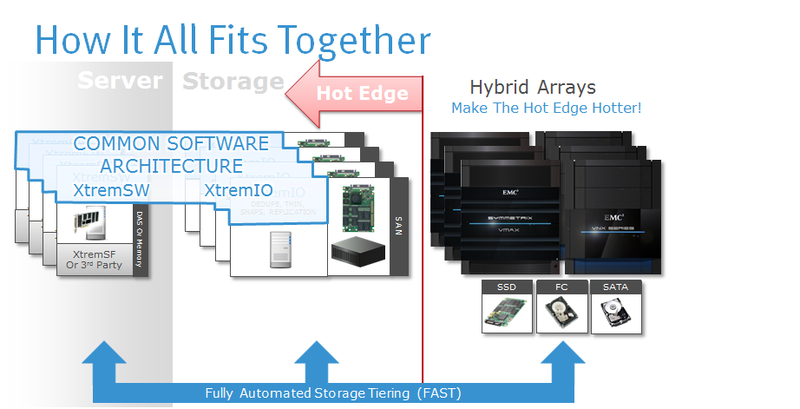 XtremIO’s software stack is based on a scale-out architecture. What you see in the image on this slide is a single building block in the XtremIO array. Multiple building blocks can be tied together to form a single system of any desired capacity and performance level, while delivering a linear scaling of performance – you add more building blocks and you get a proportional increase in performance without any increase in latency. And the scale-out design is inherently balanced, meaning that all SSDs and all controllers are equally leveraged at all times, which allows XtremIO to deliver superior performance while remaining incredibly easy to configure and manage. 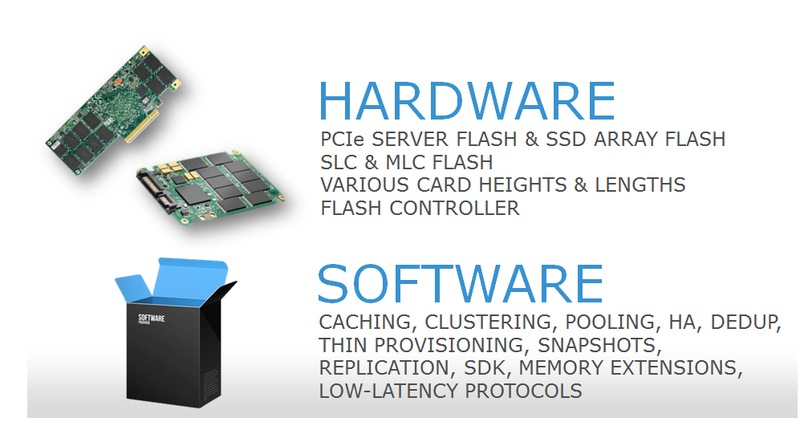 And finally, the XtremIO system delivers a rich set of flash-optimized data services. Many competing arrays do not even offer data services, and deliver only “hero” numbers for performance. In contrast, XtremIO delivers incredible performance while all data services are active – something completely unique in the industry. Writeable Snapshots: Instant, completely space efficient (both data and metadata) writeable volume copies that can be in any topology and which can be used just like the parent volume – full flexibility and full performance. Allows huge consolidation of dev/test environments with a small capacity footprint. Here’s what we mean. These charts show the “Functional IOPS” performance of an XtremIO cluster as it is scaled-out. By functional performance we mean that the flash has been pre-conditioned so that there are no zero flash pages, that the array is running nearly filled to capacity (80% full) and that we’re running a fully random, non-cacheable workload over an extended period of time. In addition, all data services are active – meaning the array is using thin volumes, is performing in-line data reduction, and volumes can be parents or writeable snapshots. And all of this is done while maintaining sub-millisecond response times. 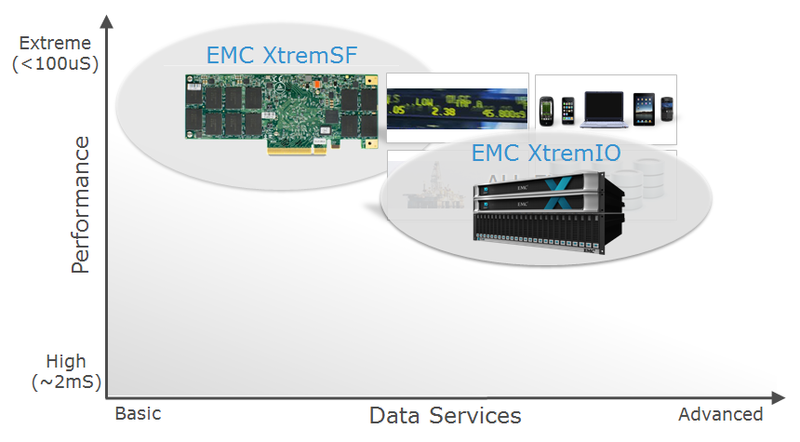 XtremIO is a scale-out block architecture. As data comes in we balance the data across every node in the cluster. It doesn’t matter whether it’s reads or writes or mixed performance, we see linear scalability. Want a million IOPS, no problem, just add more nodes. Response times remain under a millisecond, regardless of the size of the XtremIO cluster. And performance is consistent whether the system is busy or loaded, empty or full. Again, it’s important to note that our tests are run with all data services enabled. Most competitors turn all data services off (or don’t offer data services in the first place) to get the appropriate numbers. Next Post Next post: It’s NOT About Flash !